Oatmeal cookies are good for our bodies due to a significant number of beneficial nutrients in its composition. In addition, modern recipes include the incorporation of oat biscuits with various fillers in the form of raisins, vanilla, fruit syrups and jam, chocolate chips, and more. Oatmeal cookies are especially good when eaten for breakfast or in addition to a glass of milk. Experts believe that such breakfast equals to the plate of oatmeal porridge in the number of vitamins and nutritional elements. 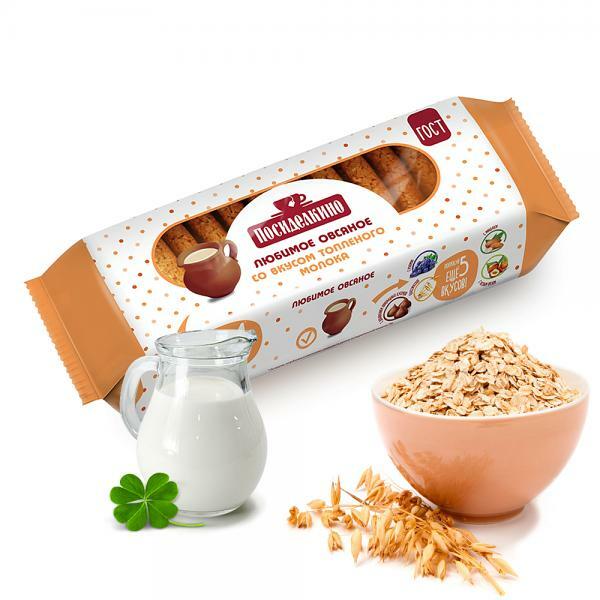 Oatmeal cookies with the flavor of baked milk are rich in proteins of vegetable origin - and they are extremely important for supporting the health of the organism at the cellular level, as it hinders the active destruction of cell membranes. In addition, the biscuit contains a large number of vitamins - group B, PP, H, E. Regular replenishment in the body - the source of healthy beautiful skin and hair, as well as - the lack of stress, neurosis. Oatmeal cookies are useful for our body by a significant number of easily digestible nutrients in its composition. In addition, modern recipes include the inclusion in the oatmeal cookies of various fillers: raisins, vanilla, fruit syrups and jam, pieces of chocolate and much more. It is especially good to eat a few biscuits for breakfast with a glass of milk. Made according to GOST 24901-2014. With natural cinnamon and whey. Wheat flour, sugar, oat flour, refined deodorized vegetable oil, apple semis (apple puree, sugar, thickener: pectin, acidity regulator: citric acid); treacle, whey powder, flavoring, emulsifier: soy lecithin; salt, baking powder: ammonium carbonate, sodium hydrogen carbonate (food soda); cinnamon, acidity regulator: citric acid. The product contains wheat, gluten, dairy products, soy lecithin. The product may contain traces of hazelnut, almond, peanut, sesame, egg white.